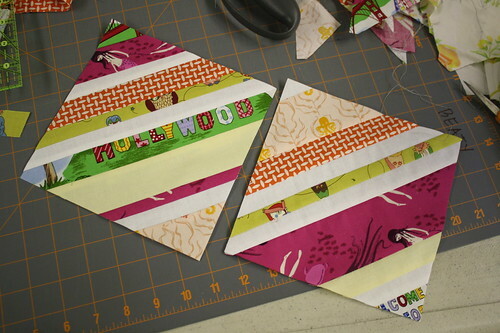 Although, somehow, I managed to mix up the stacks and ended up with two of the same fabrics in a bunch of blocks. I’m still not sure how I managed that. I had planned to forgo the lattice layout and do white sashing instead…to make the quilt bigger and to calm down the craziness of my blocks. But it turns out that they lose most of their charm with the white sashing, so I’m going with the lattice. I also think my mistakes are VERY hard to find in the lattice layout…not that my sister would complain about them anyway. And this is for her. 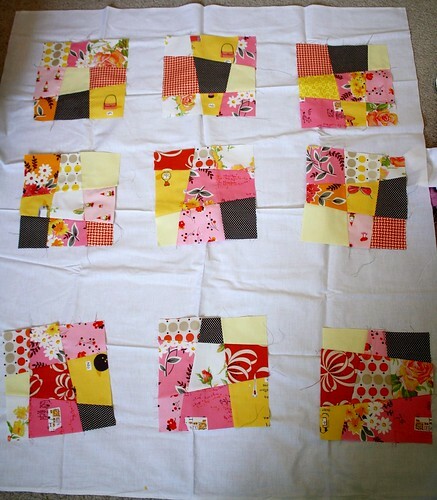 I may still have to add a border to make it a good nap size quilt. We’ll see. What do you think? I also got a couple of string blocks done for Urban Craft Center’s collaborative Haiti quilts. Thanks again to Latifah for picking up the fabric and instructions so I could participate! 45 blocks, wow! i wish i had the patience! 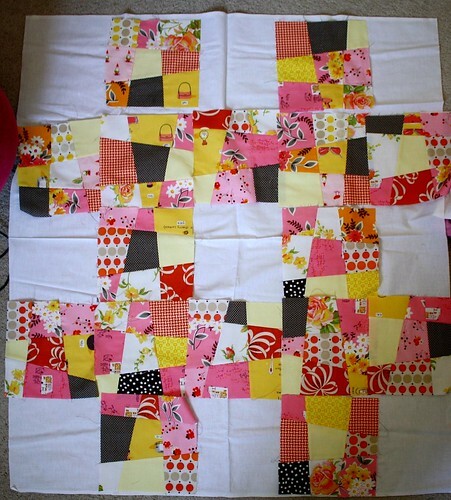 i prefer the layout with the sashing, personally, because that way you really get to see and appreciate the individual blocks. can’t wait to see the finished quilt! heee hee, that’s kind of why I like the lattice…some of my blocks should not be seen! :) Thanks for stopping by, Suzy! I’m with Suzy, I like the sashing too. oh, now you guys are making me doubt my decision! I could make it much bigger with the sashing…if I did 3″ or 4″ sashing? Mucho bigger-o. 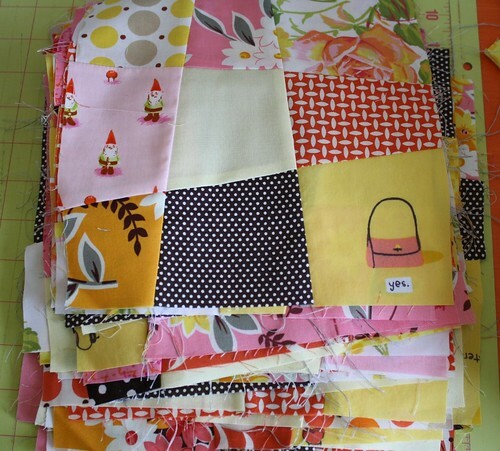 Without sashing, it is going to be about 58″ x 70″…not so nap quilty. i also liked the white when i first saw it yesterday! what about white and then red edging/frame, so that when the edges get dirty, it won’t show up as much? obv i don’t know anything about this stuff!! Hey Abi! Seeing you do these on Saturday inspired me and I started some of my own…however my seams do not match up as gorgeously as yours. Did you decide on a layout? what does modern quilter mean to you?